CIFE colleges welcome students joining for the final-year A-level courses and can provide new subjects as well as building on what you've learned in lower sixth. Each year many students join CIFE colleges for final-year A-level courses, to build on a sixth-form course that they have started at another school. Their reasons for making the change vary. In some cases it is because they've lost momentum through illness or social distraction. It may be that they need to change one or more A-level subjects which they've been struggling with or simply not enjoyed learning about. However, students often tell us that they simply feel it is time to move on. CIFE colleges are particularly good at providing a safe bridge between a child-based school environment, and more adult learning styles. Final-year A-level courses at a CIFE college can make all the difference and change half-way through the sixth form often has a very positive effect on a student's morale and achievement. Because most subjects follow similar content and delivery patterns, you should find that changing easy. At interview you'll be asked about the topics you've covered, just to check that your upper sixth course will not miss out topics you need to learn. If your first year included any of the the 'old' modular exams, you'll find that the AS / A2 exam structure works in your favour. In most cases you go straight into upper-sixth A2 courses at your new college, carrying forward AS marks from your previous school. This is usually possible even if moving involves a change of exam boards. There are a few restrictions but most changes are allowed by exam boards. 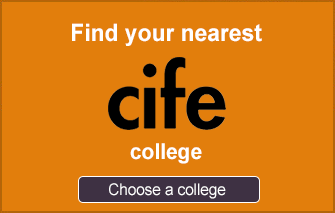 CIFE colleges can give you expert advice on all of this. What if you have just finished lower sixth and ended up with disappointing results? Unless you have had a complete disaster you should be able to carry on into upper sixth. If you've have come down badly across the board you might be better off considering changing into one-year A-level courses (see link to right). That way you will get taught for both parts of the syllabus. You even have the option of continuing upper-sixth courses in the subjects you like and taking up one or two completely new subjects as one-year A levels. It's not always easy to work out what went wrong if you had a bad year in lower sixth. And finding the best course combination to get back on track can be really confusing. CIFE colleges will be happy to meet you to talk things through and they'll certainly give you an expert and independent perspective. Do contact us if you need help.